I am sure you have been in a meeting, where the meeting end time rolls around and there is a knock at the door from the people who want the meeting room now, as their meeting time has started and yours has finished. What if you could recover five, eight, ten or more minutes per meeting so that the next meeting party can get into the room on time, and you have time to get out and get to your next meeting, and be on time. Well since the beginning of 2019, Microsoft have come to your rescue. The above are the new calendar “End appointments and meetings early” option. It is available in Outlook for Windows that is part of Office 365 ProPlus and you need to have a version of the software released new in 2019 for the feature to be available – more on the version and what to do in the technical section below. The above option is found from File > Options > Calendar and then looking under Calendar Options as shown. Check the option ”End appointments and meetings early” and then choose the time that a meeting under 1 hour will end early, and you can choose 5, 8 or 10 minutes, and then a second option for meetings over 1 hour – these can end 5, 10 or 15 minutes early. You can also enter your own preferred end early time. Click OK and go create a new meeting. It should not matter how you create the meeting. I’ve highlighted the new end time – its 25 minutes after the meeting starts! The adjustment applies to the default meeting length and shortens it for me. 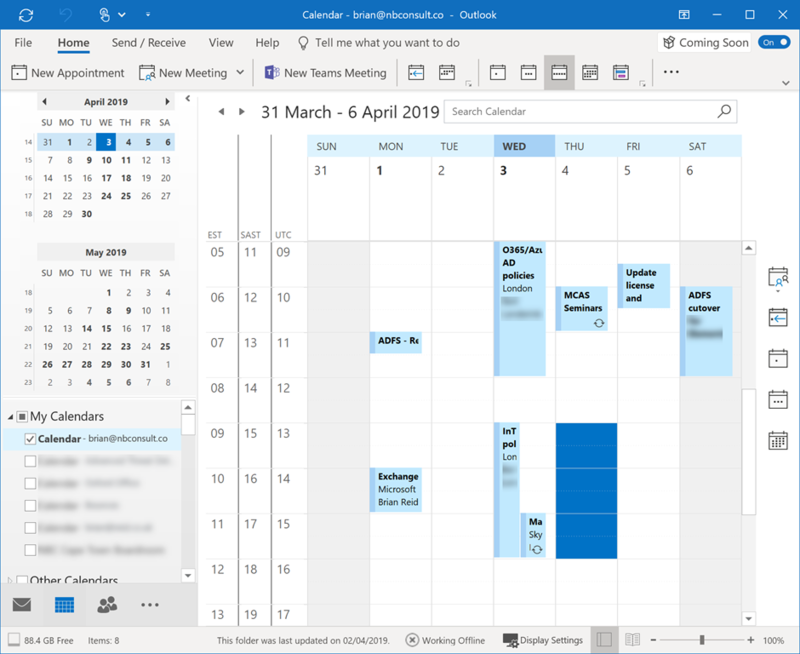 If for this meeting I want it to be the full 30 minutes, I can just write in the new time – all Outlook is doing is setting a new adjustable default for me. The meeting is created with an end time ten minutes early (my preferred time saving duration for meetings over one hour). As with the above, I can adjust the time of this meeting to the full hour if I want to very easily – just drag the meeting block to the full hour and it is kept. Its just the default time when I first create the meeting that is adjusted. But what if you are the HR department or the representative of the department for digital change – what if you want to try and improve company culture and change these defaults across the board – well this is a job for IT, but they can easily roll out a setting to all your computers that set a end early time for both short and longer meeting durations. The EndEventsEarly value is the setting that turns the feature on. So as well as setting the end early times, you need to set this value to 1 as well. 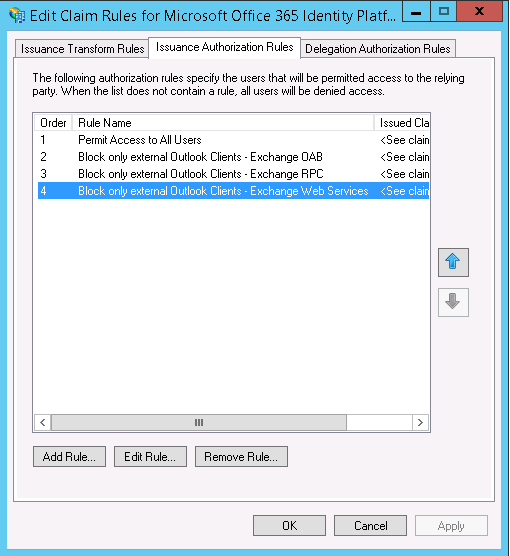 If you want to roll out this change centrally and ensure that the end user cannot set their own custom end early time then you can change the registry key policy settings via HKEY_CURRENT_USER\Software\Policies\Microsoft\Office\16.0\Outlook\Options\Calendar. Changes in this registry location mean the user cannot adjust the end early times. You can disable this option centrally as well by setting EndEventsEarly DWORD value to 0 – this has the effect of disabling the check box and so users cannot turn the option on. All these three settings are included in the latest update to the Office365 Administrative Templates, available on Microsoft Download Center: https://www.microsoft.com/en-us/download/details.aspx?id=49030 as well. 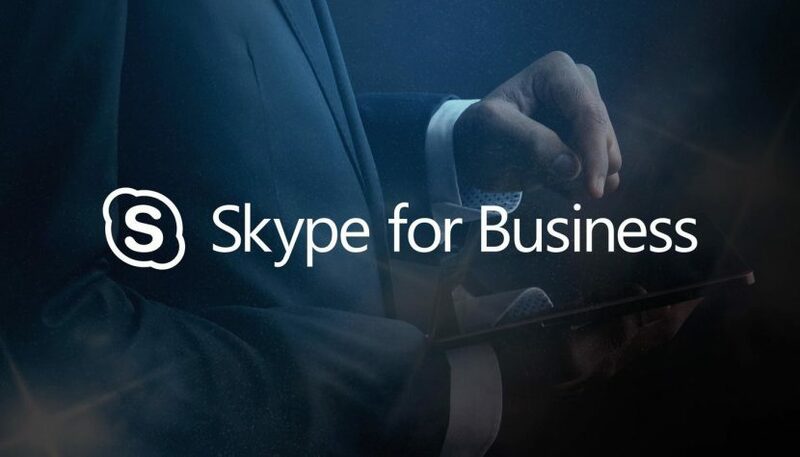 I have had this issue for ages, but could not find any answer for it on the internet that did not involve resetting Skype for Business or other complex stuff when in fact the answer is so easy it hurts! Finding it was one of those Duh! moments. 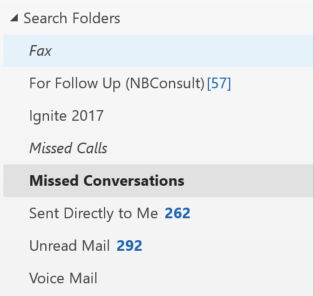 Skype for Business shows a red flag in one of the sections that will not go away. In my case it was the Conversation History pane and all the conversations in the view were read! Its a Search View and it was already active for me, but look – it also says one conversation unread. 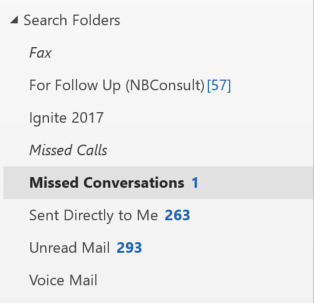 So I scrolled down the list of conversations in Outlook, found the unread one and the issue went away in Skype for Business within seconds. 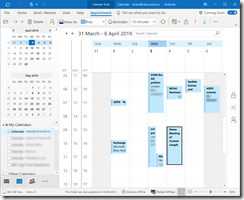 This issue will probably be true for Teams as well when Outlook Conversation History functionality moves over to that product as well from Skype for Business Online! So where does one see this issue? It happens when the parent folder in question, in this case the “SO” folder is created by Microsoft’s PST Capture Tool. The PST Capture Tool creates a parent folder in the Online Archive in Exchange (in this case Exchange Online but it does not matter which Exchange Server) named after the PST file, so in this case SO.pst was uploaded by the PST Capture Tool. Any attempt to create folders inline below this parent folder fails! If you drag content into this folder it will not allow you to drop the content in, and the folder appears to be read-only. 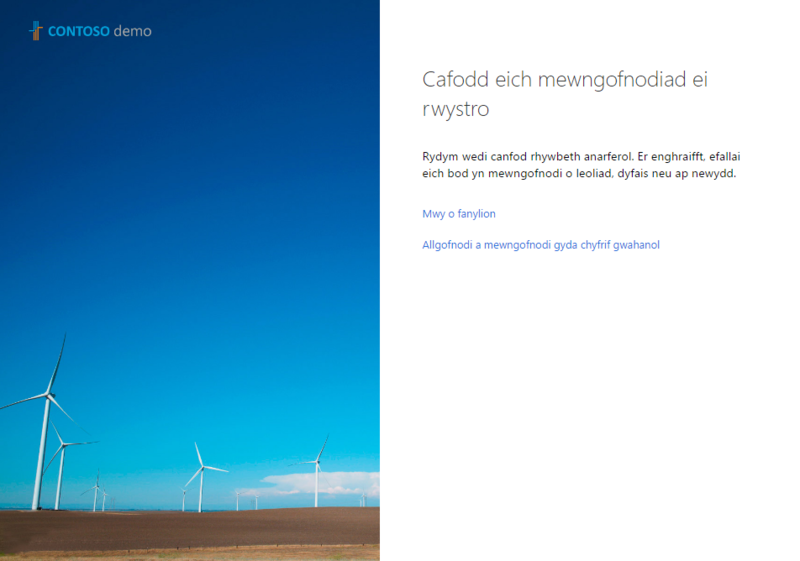 If you change Outlooks view to Folder view (click the … on the Outlook 2013 view bar to the right) then you can create folders (using a dialog) and that works fine – this is how “Test Dialog” was made in the above pictures. In Outlook 2010 all works as expected! In Outlook 2013 the issue appears to be the way Outlook handles folders that have a MAPI property on the folder created with a null value. In tools such as MFCMapi and OutlookSpy you can view the MAPI properties of a folder and the folder created by PST Capture Tool has a property call PR_CONTAINER_CLASS_W with a null (empty) value. 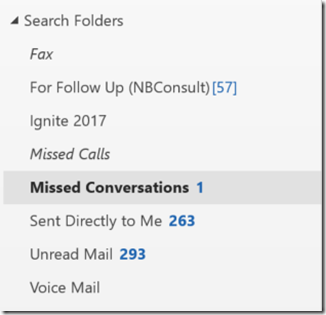 Normally, Outlook will make folders that have “IPF.Note” as the value of this folder, if this is a mail and notes folder (i.e. not a calendar or contact etc folder). But clearly there is a problem, as Folder view allows you to create subfolders when the parent’s PR_CONTAINER_CLASS_W value is null and so does Outlook 2010 and coincidently does OWA! The fix, but I do not have it ready yet, is to run an EWS script to reset the PR_CONTAINER_CLASS_W property of this folder to IPF.Note or wait for an update to Outlook from Microsoft, and for that I have contacted them. With thanks to fellow MVP Jaap Wesselius for double-checking this for me and testing it in Outlook 2010. Now this sounds a stupid sort of error, because if I am moving an archive mailbox then it must already be enabled or the move mailbox wizard will not let me move it. But the mailbox does have an archive on the Exchange organization on-premises, but when the move has completed it has errors reported. The reason for the error is all down, in my case, to two things. DirSync is not working at the moment. In my scenario the DirSync services on my server had stopped a few weeks ago and I had not started them – ensure that DirSync is running. And secondly, as it was a demo I was doing I was creating an archive mailbox and then moving it to the cloud shortly afterwards. 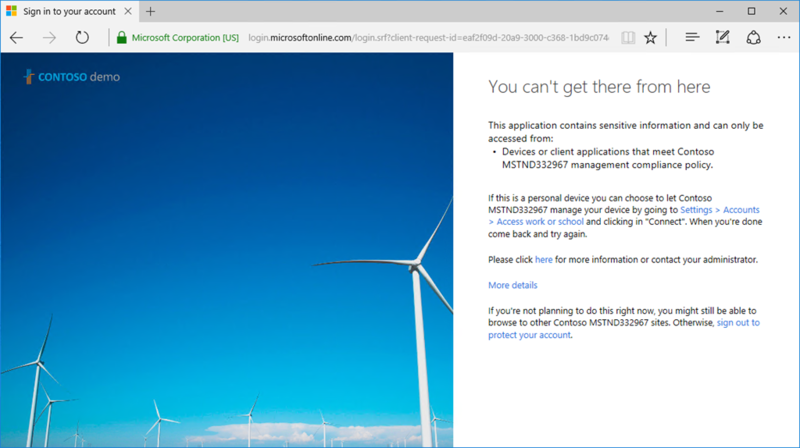 Even if DirSync was running, the chances are that it would not have had a chance to sync the existence of the archive mailbox associated with the user account to Office 365’s directory. Archive mailboxes can only be moved from on-premises to the cloud if the cloud service knows about the mailbox archive to move. To fix my issue I restarted DirSync services and forced a full sync with the cmdlet Start-OnlineCoexistenceSync –FullSync. See http://technet.microsoft.com/en-us/library/jj151771.aspx#BKMK_SynchronizeDirectories on the steps to force a directory sync for running this cmdlet. 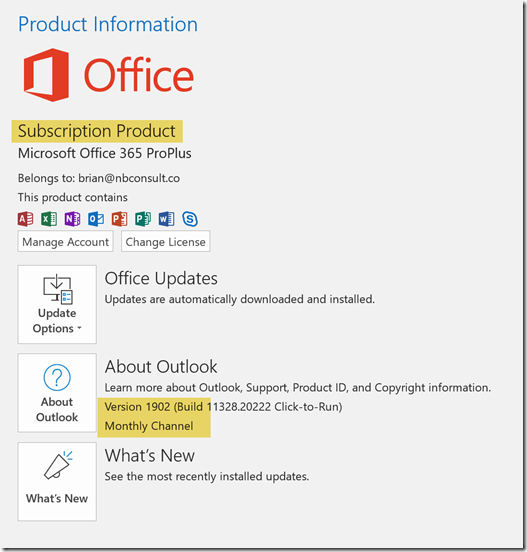 Once the sync was completed and Office 365 directory is aware that my user has an on-premises archive I was able to move the archive to Office 365 and keep the mailbox on-premises. Of course, if I want to create an archive in the cloud with a mailbox on premises for real (not a demo) then I would just create the archive straight in the cloud. My scenario and the three hour DirSync delay (or forcing DirSync) was only needed as I had created an archive and then moved it. This blog is the start of a series of articles I will write over the next few months on how to ensure that your data is encrypted and secured to only the people you want to access it, and only for the level of rights you want to give them. The technology that we will look at to do this is Microsoft’s recently released Windows Azure Active Directory Rights Management product, also known as AADRM or Microsoft Rights Management, or “the new RMS”. The items above will get lit up as the article is released – so check back or leave a comment to this post and I will let you know when new content is added to this series. Simply this is the ability to ensure that your content is only used by whom you want it to be used by and only for what you grant. Its known in various guises, and the most common guise is Digital Rights Management (DRM) as applied to the music and films you have been downloading for years. With the increase in sharing music and other mp3 content in the last ten plus years, the recording companies and music sellers started to protect music. It did not go down well, and I would say this is mainly because the content was bought and so the owner wanted to do with it as they liked – even if what they liked was legal they were limited from doing so. I have music I bought that I cannot use because the music retailer is out of business or I tried to transfer it too many times. I now buy all my music DRM free. But if the content is something I created and sold, rather than something I bought I see it very differently. When the program was running I was one of the instructors for the Microsoft Certified Master program. I wrote and delivered part of the Exchange Server training. And following the reuse of my and other peoples content outside of the classroom, the content was rights protected – it could be read only by those who I had taught. Those I taught think differently about this, but usually because the management of getting a new copy of the content when it expires! But this is what rights management is, and this series of articles will look at enabling Azure Active Directory Rights Management, a piece of Office 365 that if you are an E3 or E4 subscriber then you already have, and if you have a lower level of subscription or none at all you can buy for £2/user/month and this will allow you to protect the content that you create, that it can be used by only those you want to read it (regardless of where you or they put it) and if you want it can expire after a given time. In this series we will look at enabling the service and connecting various technologies to it, from our smartphones to PC’s to servers and then distributing our protected content to whom needs to see it. Those who receive it will be able to use the content for free. You only pay to create protected content. We will also look at protecting content automatically, for example content that is classified in a given way by Windows Server or emails that match certain conditions (for example they contain credit cards or other personally identifiable information (PII) information such as passport or tax IDs) and though I am not a SharePoint guru, we will look at protecting content downloaded from SharePoint document libraries. Finally we will look at users protecting their own content – either the photographs they take on their phones of information they need to share (documents, aka using the phones camera as a scanner) or taking photos of whiteboards in meetings where the contents on the board should not be shared too widely. Stick around – its a new technology and its going to have a big impact on the way we share data, regardless of whether we share it with Dropbox or the like or email or whatever comes next. Message Classifications are a way to tag email with a property that describes the purpose of the email, for example “Internal Use Only” might be a classification to tell the recipient of the email that the message should not be forwarded. 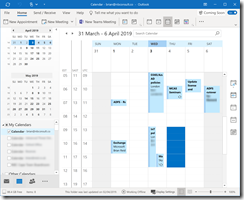 Classifications are configured by administrators and appear shortly after creation in Outlook Web App, but need further work for them to appear in Outlook. Once you have a classification system in place, you can use Transport Rules in Exchange to read the classification and act on the message, for example if the message is classified “Internal Use Only” and the recipient is in an external domain then an NDR could be returned and the message dropped. This creates a classification called Default\Name. 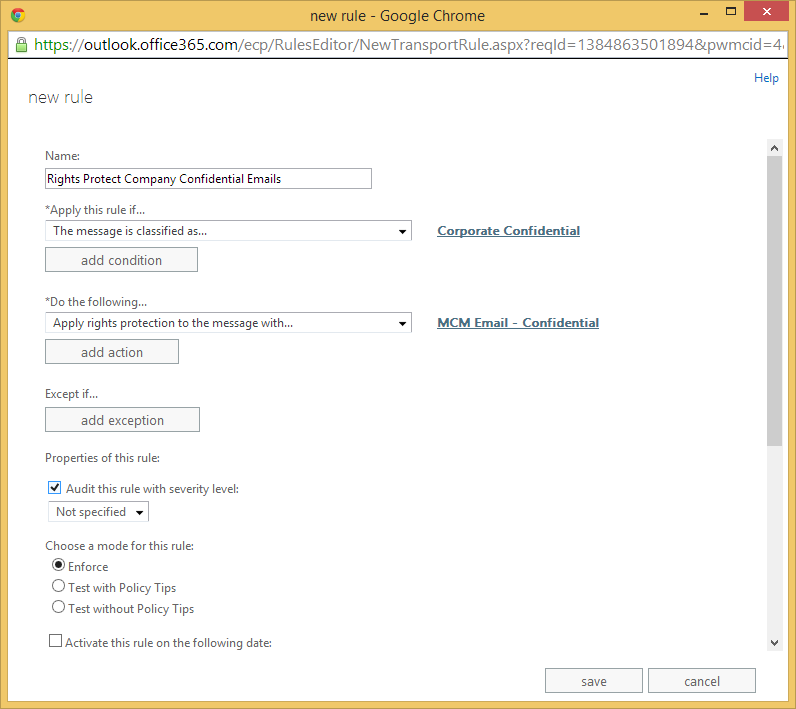 In the above example this would be Default\CorporateConfidential. This value is not seen by anyone other than the administrators of Exchange, users see the DisplayName value. The SenderDescription appears at the top of the message as it is being written in Outlook or OWA and you can have a different RecipientDescription for display in the recipients email. In the above example the SenderDescription (which is required) will also be the RecipientDescription as that was not specifically set. Once you have the correct translation, which you need for the DisplayName and SenderDescription, you run the cmdlet which sets the language against the previously created classification. Note that at the time of writing this cmdlet does not work in Exchange Online (see reported issue for more). Remember to change the name of the classification and the RMS template name to suit. 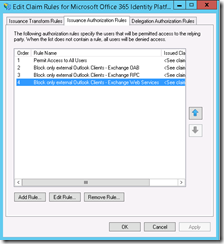 Also remember that if you have Hybrid Exchange mode enabled, you need to create the transport rule in both locations, therefore you need RMS enabled in both locations (though if you are not using RMS as this example does, you do not need it enabled to do message classificaitions). Once the rule and the classification are created, send an email using OWA where you have set the classification during composing the email. Note that during testing I found it could take up to 24 hours for Exchange Online to show both the RMS templates in OWA and the message classifications. Note that at the time of writing there is a bug in OWA in Exchange 2013 that causes transport rules to not see the classification correctly. Tests using Outlook (see the next few steps) will work fine. To send the email using Outlook you need to first export the message classification using Export-OutlookClassification.ps1 script from Exchange on-premises (in the Exchange/v15/scripts folder of your installation). To export from Exchange Online you need to copy this script from an on-premises installation and run it in your remote PowerShell window connected to Exchange Online. You need to set the path correctly in the registry as to the location (on the local computer or always available network drive) that the classifications xml file is located. 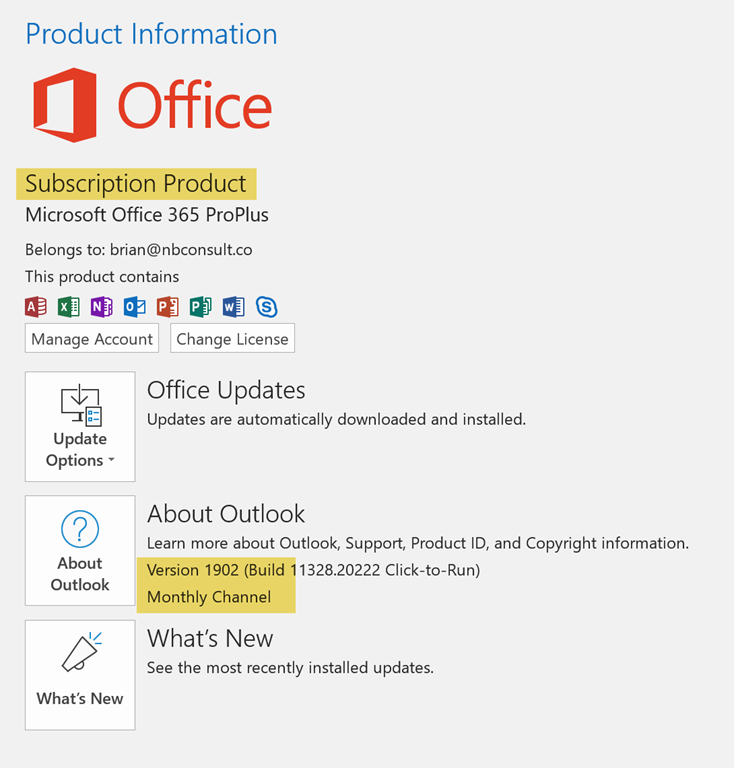 This registry set is for Outlook 2016 – change the version number from 16.0 to suit earlier versions of Outlook (2013 = 15.0, 2010 = 14.0). Once the registry is set and the classifications XML file in the location the registry will look in, restart Outlook and compose a test message, setting the classification you are looking for in transport rules. When the message arrives at the destination inbox, if it was sent with the classification then it should have the RMS template applied (the action of the transport rule). In the following screenshot you can see two emails in Outlook. 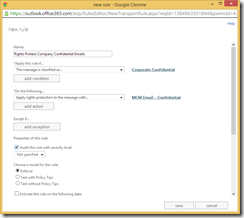 The lower email was sent with OWA and due to an OWA bug the classification is set incorrectly and so it is not RMS protected as the transport rule does not fire. The upper email can be seen to have RMS protection, though I cannot screenshot it as it has RMS protection and that stops me using PrintScreen or OneNote screen clipping tools whilst that message is open! It’s a well documented issue with Outlook 2003 connecting to Exchange 2010 that means Outlook 2003 is not as responsive in Online mode as it was with legacy versions of Exchange Server (http://support.microsoft.com/kb/2009942). What is less well documented is an odd error message that can appear because of this interaction. Imagine the following scenario. User on Outlook 2003 has lots of messages to delete, and deletes them one at a time. 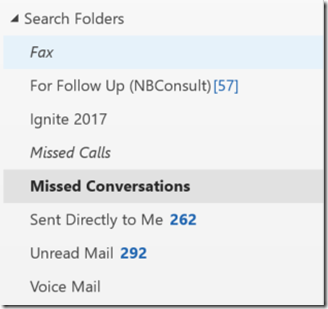 Outlook will not refresh the display for up to 5 seconds (the lowest setting that you can tell Outlook to refresh, via the Maximum Polling Frequency registry key). The problem is that if the user deletes a message and it does not disappear from the screen and then (thinking its gone, and the highlight has moved onto the next message) presses delete again. 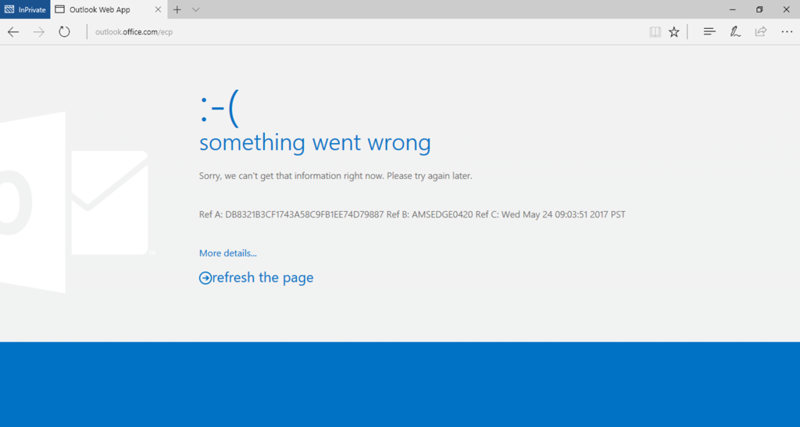 Outlook generates “Unknown Error” – which is not exactly helpful, and could appear as often as every other message that is deleted. How to fix: Cached mode (though in the scenario I came across the above it was Outlook on a Terminal Server, so that’s not an option), upgrade the client version of Outlook, or use Shift or CTRL select and delete all your emails in one go! This has been obvious to me for a while – whenever I viewed this blog in Outlook 2007 via the common RSS feed store, the dates were all incorrect and so new posts appeared at random within the list. I finally found a fix yesterday – the post was based upon ATOM technology and not RSS technology. I have therefore changed the subscribe link on the site to add ?alt=rss to the end of the link. If you subscribe to this blog please delete it from your feed store in IE 7 and resubscribe at http://reidablog.blogspot.com/feeds/posts/default?alt=rss.